Researchers at the University of California at Riverside found a way to introduce magnetism in graphene while still preserving electronics properties. This may represent a significant step forward in the use of graphene in chips and electronics, since doping in the past induced magnetism but damaged graphene's electronic properties. this method can also be used in spintronics - chips that use electronic spin to store data. The scientists explain they have overcome the problem by moving a graphene sheet very close to an electrical insulator with magnetic properties, since placing graphene on an insulating magnetic substrate can make the material ferromagnetic without disturbing its conductivity. 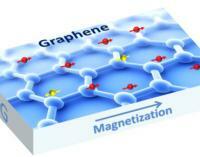 The magnetic graphene is said to acquire new electronic properties, and so new quantum phenomena can take place. The research team used yttrium iron garnet grown using laser molecular beam epitaxy. They placed a single layer of graphene on an atom-thick sheet of yttrium iron garnet, and discovered that graphene “borrowed” the magnetic properties of the material. The researchers state that they managed to avoid interfering with graphene’s electrical transport properties by using the electric insulator compound. The UC-Riverside researchers claim that their technique also enhanced spin-orbit coupling that is believed to be inherently weak in graphene. The proximity-induced magnetism in graphene could lead to novel transport phenomena that are potentially useful for spintronics. NSF and the U.S. Energy Department funded the UC-Riverside graphene research.